For sale we have a 1934 Mercury Pick Up. Before you pick up the phone and call us we know they didn't make a '34 Mercury Pick Up. However, if they did we sure hope it would have looked like this. The truck we have started it's life as a 34 Ford then Ricky Bobby Rod Shop turned into this sweet ride. This car took the Good Guys Builder Choice award and is an absolute head turner. They started with a 34 Ford Cab that was chopped 4”. The frame, Hood and Side Panels are made from flat stock that was worked and rolled to fit. The side panels had custom inserts to fit around the engine. For the bed they started with a repop bed that was shortened and has a custom Mercury Tail Gate. Everything is painted in the Rich Navy Blue that has a deep rich shine and is slick to the touch. To keep with the old school look the wheels up front are 16x4 from a 40 Ford and the rears are 18x7 custom Circle Racing Wheels with Merc Hub Caps. The inside is done in Tan with a bench seat. All the metal dash is painted body color to create the perfect flow from the exterior to the interior. 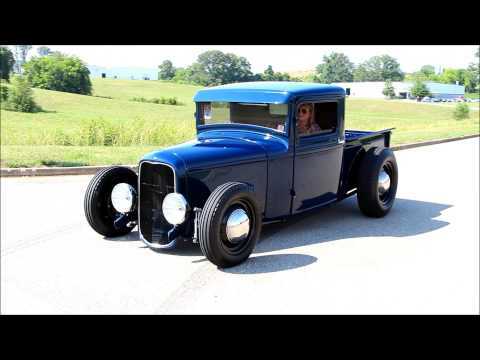 It has a 40 Ford Insturment panels and steering column with a 15” 40 Ford Wheel. The pedals are by Kugel. This truck also has the tilt out front windshield. Under the custom hood is a '51 Merc Flat Head V8. It has Eddie Meyer Heads and Intake with Stromberg 97 Carbs. The trans is a 3 Speed with Over Drive. The frame is form a 34 Ford that was sectioned 2 ½” it was also boxed form the firewall back. Under the front is a So Cal 4” Drop Axle with 37 Ford Spindles and wish bone. Under the back is a 39 Zepher Rear Wish Bone. When you look under this truck it's every bit as clean as the top.